Why is Microbiology so Important? I have called this section Microbiology and the horse because it will cover several aspects. External microbiology ie that in soils, those that trans locate through the plant, those that exist on the plant surface. 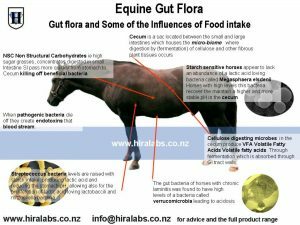 Something about toxins from fungi and /or bacteria and how they affect the horse. What can we do to correct imbalances. How food influences he gut flora and how we can start to influence the biodiversity of the gut flora. Mycotoxins are fungi found in mouldy crops or crops harvested in poor weather conditions, leading to as poor growth, skin allergies and respiratory disease. There are three major mycotoxins and they are: deoxynivalenol found mainly in grains maize oats, 15-acetyldeoxynivalenol found in grasses and rye, and zearalenone found in corn. Most horse feeds were found to be well below the levels which are usually considered as critical or even toxic. The highest concentration of ergot alkaloids was found in barley. The fungi colonise and their mycelium translocate through the woody indigestible bits of the food intake. This then further assist the gut bacteria to further degrade this fibre through fermentation. 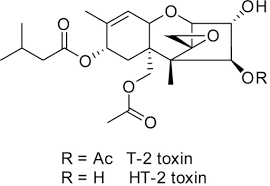 This initial breaking apart action of the fungi, enables the gut bacteria to breakdown cellulose and hemicellulose. If the fungi were not there on the woody bits this fibre would remain undigested. So if these mycotoxin binders prevent the action of fungi, what effect do they have on the beneficial fungi population on the plant? Be aware that gut fungi are very slow growing and take up to 24-35 hours to repopulate , meaning once they are dead they won’t replenish for a day or more. Where as bacteria can double in size in 20 minutes. If you are feeding a natural foraging type of diet, adding a mycotoxin binder may limit or prevent the breakdown of the ‘woody’ stalks, seeds and stems of some plants.